Targeting in particular policy makers, "University-Industry Collaboration. New Evidence and Policy Options" presents the main outcomes of the OECD Working Party on Innovation and Technology Policy (TIP) 's project "Assessing the Impacts of the Policy Mix for Knowledge Transfer" conducted in 2017-2018, and contains the main findings and policy reccomendations of the project. Building on relevant policy papers issued in 2017-2019 but also on twenty case study contributions, the report discusses challenges and opportunities in assessing the impacts of science-industry knowledge exchange on innovation and explores the complex set of knowledge-transfer channels, such as collaborative research, co-patenting, academic spinoffs, and their relative importance across science fields and industry sectors. This report presents a taxonomy of 21 policy instruments aimed at stimulating science-industry knowledge transfer, which include grants for collaborative university-industry research and financial support to university spin-offs, and discusses their possible positive and negative interactions. New policy approaches to support spin-off creation are explored as well as recent trends on the governance of public research of high relevance to science-industry knowledge transfer using newly developed policy indicators for 35 OECD countries. Please find the full report for online reading here. 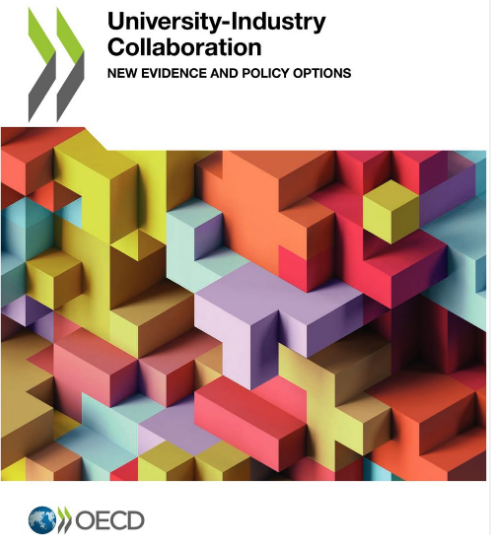 The report was published here: https://www.oecd-ilibrary.org/science-and-technology/university-industry-collaboration_e9c1e648-en © OECD 2019.